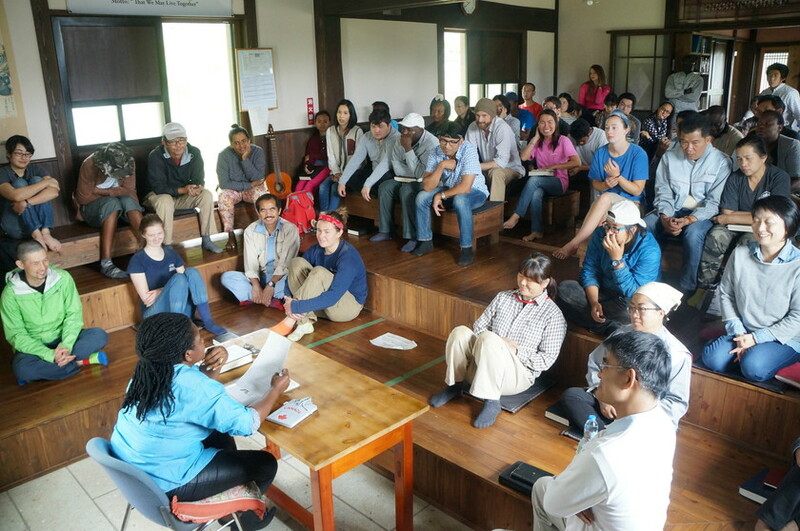 One very unique aspect of Asian Rural Institute as a school is that it is based on communal life, a life of sharing with people from all around the globe. Most of the ARI community members live together on or very near from the campus and each one is involved in the whole work of the school and farm. From the growing and harvesting of food to its cooking and eating. From cleaning toilets in the morning to leading prayer times in at evening. We take our turn doing each part. Through living together we are able to constantly have learning opportunities and in fact see our community as a community of learning. Coming together as people of fundamentally different cultural, ethnic and religious backgrounds, we dare to live together, equally sharing experiences, overcoming struggles and enjoying each others’ presence. It is in this experience of community that lasting personal transformation can happen. It provides the nurturing ground for servant leadership growth. The ARI community is a place where people are committed to a life of service. It is open to all who are seriously interested in the mission and purpose of ARI. Long term members include the Participants of the training program, Training Assistants and Graduate Interns along with the volunteers and the ongoing staff members and their families, as well as part-time workers and lecturers. To this dynamic community we welcome working visitors, work-camp groups, and other visitors to share food and life with us. At ARI we realize that our community goes beyond the people gathered here, but includes God and the creation around us. ARI’s roots are in the Christian faith. Yet we are eager to share our life with persons of all religions, for we believe that the love of God in Jesus Christ is for all people. One way of deepening our differing spiritual roots is the Morning Gathering time to which we assemble for meditation on each weekday. During this 40 minutes period, long term members share prayers, experiences and insights, reminding us that the foundation that undergirds our training program is spiritual. Thus, everyone who comes to ARI is expected to have a motivation and conviction that is spiritually motivated. Community life at ARI does not only mean work, but a lot of laughter, music, dance and joy. We often have camp fires, prayer meetings, movie nights, gospel choir singing, language classes and so on. There are monthly community events as well as fellowship opportunities with local schools, groups and churches. Yet, more than anything, being at ARI you will discover that each of us can find some sense of belonging here and that our diversity and differences, when respected, can create a dynamic life together. Won’t you come? We welcome you to the community of ARI!